Children’s authors gathered for a Friday BEA discussion about writing nonfiction for kids. The speakers were Gabrielle Balkan (The 50 States: Explore the U.S.A. with 50 Fact-Filled Maps!, Wide Eyed Editions); Steve Sheinkin (Most Dangerous: Daniel Ellsberg and the Secret History of the Vietnam War, Roaring Brook); Matthew McElligott (Mad Scientist Academy: The Dinosaur Disaster, Crown); and Winifred Conkling (Radioactive! How Irene Curie and Lise Meitner Revolutionized Science and Changed the World, Algonquin). Betsy Bird, New York Public Library youth materials specialist and coauthor of Wild Things: Acts of Mischief in Children’s Literature, moderated. The From l.: Gabrielle Balkan, Steve Sheinkin, Matthew McElligott, and Winifred Conkling. Sheinkin joked that, since he used to write textbooks, “I’m trying to make amends for that” by writing riveting accounts of real­life events. He calls Most Dangerous, about the man who leaked the Pentagon Papers, a “complex and big story... a natural thriller about a consummate insider who decides to expose the truth.” For Balkan, the impetus behind writing The 50 States: Explore the U.S.A. with 50 Fact­Filled Maps!, illustrated by Sol Linero, was to create a book about the U.S. that is a mix of “essential info” and material that readers would never have come across before, broadening the concept of a simple atlas to be something much more encompassing. McElligott began writing Mad Scientist Academy: The Dinosaur Disaster because he was just following his bliss: “I love to draw monsters, to learn about science, and I love the challenge of presenting information in an engaging and fun way,” McElligott said. The Dinosaur Disaster is the first in a series about a school run by Dr. Cosmic with a student body of monster kids who must use science to avoid situations like robotic dinosaurs coming to life and wreaking havoc. 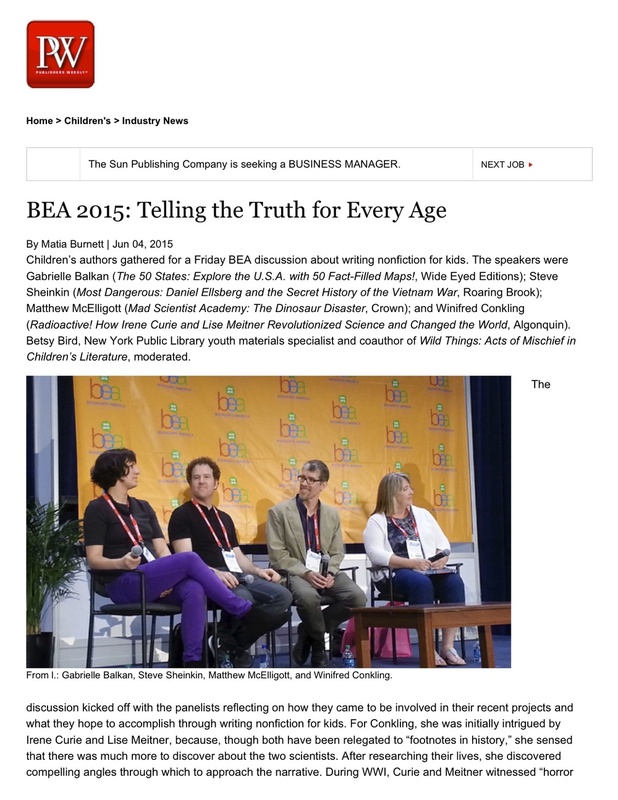 The authors discussed other challenges that are unique to writing nonfiction for young readers. For Conkling, she struggles with reigning in the amount of information she often uncovers during the research phase. It’s easy to become distracted by material that isn’t necessarily germane to a project at hand, she said, and she often has to remind herself: “What’s the arc of this story?” She admitted that, while some material might not make it into the final product, “I write it in because it excites me, and then delete.” Even if some information does not end up in the book, she makes a point to use resources that readers themselves can locate to learn more about the subject, such as the Gutenberg Project. That way, if a reader wants to, they can research the topic more in­depth and on their own terms. Sometimes, the truth can really throw a wrench in a game­plan, as McElligott explained. While he was finishing writing and illustrating Dinosaur Disaster, paleontologists made revisions to what they had previously understood a particular dinosaur to look like: “300 million years they have to decide what this dinosaur looks like,” he joked. As a result of this new scientific consensus, McElligott had to go back and revise all of the images of the dinosaur in question. Bird brought up the issue of whether the authors feel they have to leave out content that might not be appropriate for young readers. Generally speaking, the authors feel that there are very few limitations placed on them in terms of what they can include in their books. For Sheinkin, he pushes content as far as he can in terms of complexity. While he’s had some adults tell him that they think his books are too dense, he’s never had a young reader say that. For Balkan, though The 50 States is primarily “celebratory in content,” there are elements of darkness from U.S. history that are also included in the book. In those cases, it becomes a matter of angle and perspective. Balkan’s approach was to “focus on the heroes in those moments,” or individuals who made positive impacts under bleak circumstances. In closing, the speakers spoke about their own relationships with nonfiction and history growing up. In fact, none said they were particularly voracious readers of nonfiction. It was often within the context of fiction that the authors recalled becoming intrigued by history. McElligott noted how interested he was in “elements in fictional stories that are, in fact, the truth.” Sheinkin loved reading historical novels; Balkan recalled that, while “history felt very flat to me growing up,” her interest was sparked by depictions of the past in books like Little House on the Prairie. She recalls being fascinated by what characters were eating. It led her to start thinking about how history isn’t something dead from the past, but is filled with moments and choices, some small, others pivotal. “History is happening now,” she said. On Wednesday May 13, Quarto Publishing USA presented its fall titles during its first-ever librarian preview, calling attention to its new nonfiction imprint, Wide Eyed Editions. On hand was author Gabrielle Balkan, whose book The 50 States, state-by-state look at the United States, is one of the latest offerings from the imprint. The Quarto Group is charting a new course this August with the launch of Wide Eyed Editions, a visually driven nonfiction imprint that will publish 10 titles next season. At the imprint’s creative helm is publisher Rachel Williams, who also became publisher of Quarto’s Frances Lincoln Children’s Books last April. Fittingly, the line’s lead debut title focuses on its new home turf: The 50 States: Explore the U.S.A. with 50 Fact-Filled Maps!, written by New York-based editor and author Gabrielle Balkan and illustrated by Argentinian artist Sol Linero. Wide Eyed Editions’ inaugural list features an international array of authors and illustrators. In addition to The 50 States, releases include Atlas of Adventures, illustrated by London artist Lucy Letherland, which takes a visual tour of the world; Creaturepedia by Swiss artist Adrienne Barman, introducing more than 700 animals from across the globe; The School of Art, a roundup of 50 lessons on how art is made, written by Texas-born Teal Triggs, a professor at the Royal College of Art in London, and illustrated by London-based artist Daniel Frost; and The Wonder Garden, an exploration of five habitats, with text by Quarto Group editorial director Jenny Broom and illustrated by Ireland native Kristjana S. Williams. With Wide Eyed Editions’ focus on illustration and design, Williams anticipates that the imprint’s books will have appeal in specialty markets as well as in traditional book trade outlets. Quarto Publishing Group USA, the U.S. publishing arm of the U.K.-based Quarto Group, which is already well known for publishing and distributing illustrated books and other products under more than a dozen imprints, is expanding in a direction that will further enhance its expertise in that area. Quarto USA is moving aggressively into children’s book publishing in 2015 by releasing 176 children’s frontlist titles for both the trade and school/library markets. The titles will be released under four imprints, up from Quarto USA’s 20 releases in 2014 under the Walter Foster Jr. imprint. Besides Walter Foster Jr., Quarto USA will release children’s books under the Frances Lincoln Children’s Books and QEB Publishing imprints, as well as under its newest imprint, Wide Eyed Editions, which will launch in fall 2015. Marcus Leaver, Quarto Group’s CEO, who is based in London, said that when he assumed his position at Quarto in 2012, he quickly realized that the company was “under strength regarding its weighting” in its children’s portfolio, and that there was a “significant gap” in the unlicensed market. “The key characteristics of children’s books today play to our undoubted strengths in creating products that are highly visual, largely nonfiction, and with very high production values,” he noted, explaining that under his direction, the company immediately invested in pumping up the children’s publishing portfolio. “We believe children’s books are witnessing a golden age of prosperity in markets we publish into,” Leaver added. “Our established reputation and geographical flexibility place Quarto in a strong position to take advantage of the real growth opportunities enjoyed by children’s publishing.” Quarto Group’s goal, according to Leaver, is that children’s book publishing will make up 25% of the company’s net revenues within the next two or three years. In 2014, Quarto Group’s publishing revenues were approximately $140 million; of that figure, $70 million represented Quarto USA’s publishing revenues. Walter Foster Jr. releases include activity, craft, and reference books, and kits. Walter Foster Jr. has already launched its Learn to Draw series, and its 2014 release You Can Draw Cartoon Animals, by Christopher Hart, has sold 100,000 copies. In 2015, 45 titles will be released under the Walter Foster Jr. imprint, up from 20 in 2014. Frontlist includes its lead title, 101 Things to Do Before You Grow Up, and the launch of two new series this year. Walter Foster Jr. will also publish licensed titles in its Learn to Draw series, including DreamWorks’Madagascar and Disney’s Frozen. 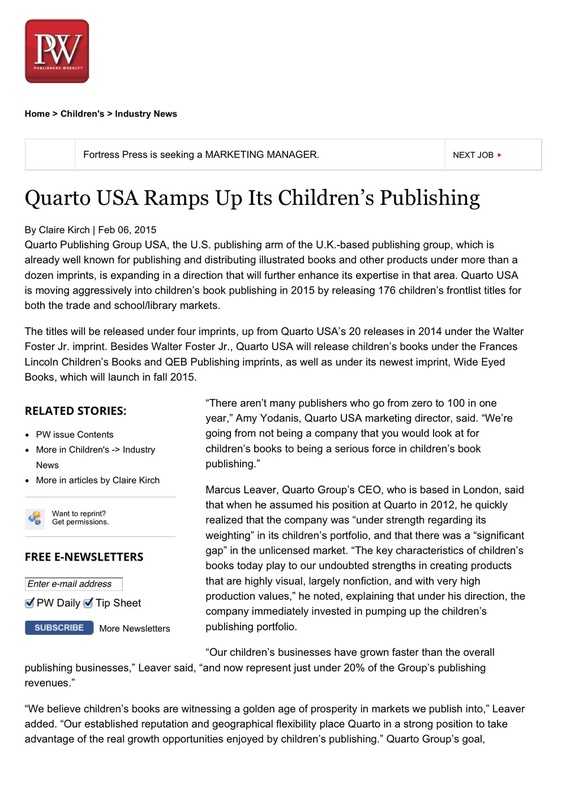 On March 1, Quarto USA will also begin distributing stateside children’s books from Quarto’s U.K. publishing division, Frances Lincoln Children’s Books, which has been publishing picture books emphasizing cultural diversity since 1983, and from QEB Publishing, launched just over 10 years ago in the U.K. as QED Publishing. Frances Lincoln’s 53 frontlist releases will include Dreams of Freedom: In Words and Pictures, a picture book produced in partnership with Amnesty International that explores the meaning of freedom. QEB, which specializes in educational entertainment for children ages 4–11, will release 67 new nonfiction titles and picture books in 2015, ranging fromCould a Penguin Ride a Bike? to 50 Things You Should Know About the Second World War. Quarto will also distribute Frances Lincoln and QEB backlist in the U.S. beginning in March. PGW was their previous U.S. distributor. Quarto USA’s newest imprint, Wide Eyed Editions, will specialize in curriculum-focused illustrated nonfiction for ages 2–10 with an emphasis on art, geography, and natural history. 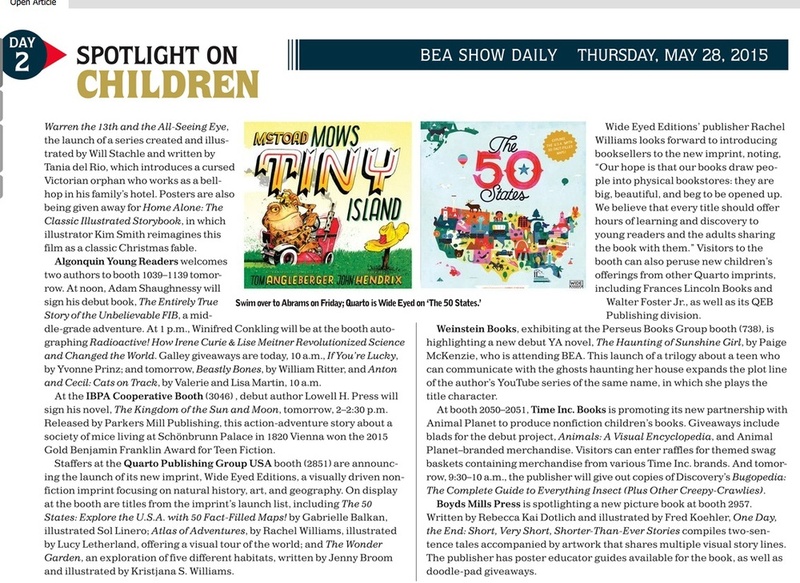 Wide Eyed launched in the U.K. this past year and will debut in the U.S. in August with 11 titles, including its lead title, The 50 States, a book of maps celebrating the history and culture of the U.S., written by Gabrielle Balkan and illustrated by Sol Linero.